How would Sir Ebenezer Howard, legendary advocate of last century’s garden cities movement and founder of Britain’s town and country planning discipline, view the transmillennial paradigm of smart cities? 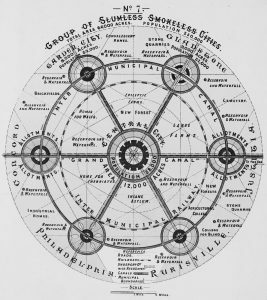 Howard’s diagrams and proposals for ‘slumless, smokeless garden cities of to-morrow’ were published in 1898 and later years; to offer a healthier antidote to the coal-blackened cities of Britain and America as their industrial revolutions accelerated. He proposed utopian ‘town-country’ suburbs that could provide residents with the beauty of nature and social opportunities, low rents and prices, high wages, pure air and water with good drainage, bright homes and gardens, and a culture of freedom and cooperation. By 1920 he created the first garden cities, at Letchworth and Welwyn in Hertfordshire, and was influencing the planning of new towns and cities in many other countries, including Germany and Australia’s ‘bush capital’, Canberra. His new towns in the countryside, and his notions of zoning cities into different places for different purposes, were criticised by American writer Jane Jacobs in her 1963 book, The Death and Life of American Cities, where she celebrated the vibrancy of 24 hour streetlife in New York, compared to the dead downtowns and precincts of less-dense cities. Howard was optimistic about science and technology; wanting to use machinery of ‘the best and most modern type’ to build garden cities. Like Edward Bellamy, the protagonist of America’s City Beautiful movement, he believed that technology could help free many people from degrading work. It seems likely that both Howard and Bellamy would have welcomed the ‘smart cities’ movement that was ignited by commercialisation of the internet, and mobile telephony, since the mid-1990s. The term ‘smart cities’ was coined 1995-2003 by Professor William J. Mitchell, Dean of Architecture and Planning at the Massachusetts Institute of Technology until his death in 2010. His faculty still includes the legendary MIT Media Lab, founded by another architect, Nicholas Negroponte, and Mitchell’s own Smart Cities Lab, founded in 2004. The ‘smart cities’ neologism has been exploited by many global technology and engineering corporations to sell broadband infrastructure and services to governments around the world – whose leaders must boost the innovation reputations and socio-economics of their cities. Since telecommunications became ubiquitous in most parts of the world, attention has turned towards content; especially how to convey useful information – data – that could help people and organisations understand their circumstances and better manage their goals. What are the differences, now, between smart cities and data cities? Essentially, promoters of smart cities seem primarily concerned with supplying networked infrastructure at precinct and citywide scales, while proponents of data cities seem focused more on useful applications of the networked information. Urban planning on a wall-size screen at the Singapore-ETH Centre (SEC-CIVAL). Sydney-based writer Davina Jackson, an ally of Mitchell’s when she edited Architecture Australia during the 1990s, coined the term ‘data cities’ in 2004. From 2005 to 2008, she was contracted by the University of New South Wales and the NICTA research organisation (now merged with the CSIRO) as a professor and evangelist to catalyse a ‘national and global digital-data cities network’. Initiated with four professors of computer-aided architecture and design (CAAD). This idea later evolved to a manifesto sponsored by the Geneva-administered Group on Earth Observations (GEO). Here is the original dynamic logo branding for the d_city (data cities) network, created in 2006 by Sydney videographer Mat McCosker with the soundscape by Chris Hancock. This now-familiar visual idea was innovative when released—several years before IBM launched its Smarter Planet and Smarter Cities campaigns. D_City 2006 logo video from Davina Jackson on Vimeo.